“How lucky we are in England to inhabit such a diverse, mysterious, symbolically rich landscape” – some words of John Michell in his Introduction to “The Sun and the Serpent“. How lucky indeed! Of no part of these islands is it more true than Essex and East Anglia. Lacking dramatic features, much of the regions landscape is one of gentle contours and meandering streams, subtle and understated, it’s patchwork of field and woodland the end product of human activity since Neolithic times. The relative scarcity of known ancient sites only adds to its mysterious quality. Astride the upper reaches of the Colne River in north Essex stand the two Hedinghams, Sible to the west and Castle to the east, two small country towns roughly half way between Colchester and Cambridge. A Historic Town Assessment Report carried out in 1995 points out that present day Castle Hedingham owes it’s development to the patronage of the de Veres, Earls of Oxford. Sible was a more scattered community until the late 19th century brought the railway (briefly) to the area, and in it’s wake light industry and an associated need for more housing and shops. Alberic de Ver from the Cotentin peninsular fought alongside Duke William at the Battle of Hastings. He was rewarded with the manor of ‘Haingheham’, together with 1200 acres of what is now much of London’s West End (Earl’s Court, de Vere Gardens, Oxford Street, are some of the names which have their origins in that grant) and estates in Cambridgeshire, Huntingdonshire, Northamptonshire and Suffolk. The name became anglicised to Aubrey de Vere. The de Vere Crest was the Blue Boar, and the badge worn on their shields the mystic 5- pointed star or mollet. According to Leland de Vere was commanding part of Bohemond’s army laying siege to Antioch during the First Crusade. At a critical point ‘a whyte Starre or Molette of fyve Pointes‘ alighted on his Standard, ‘then shining excessively‘ it led the Christians to a miracle victory. In 1142 Aubrey de Vere III (known as The Grim) was made Earl of Oxford. The present castle, which replaced an Anglo Saxon timber structure, was probably the entry fee to the Earldom. The de Vere’s were a remarkably durable family producing an unbroken line of 20 Earls of Oxford over six centuries. In 1625 the estate passed by marriage to the Ashurst family. The present owner, the Hon. Tom Lindsay, is a de Vere descendant on the distaff side. Due, in large measure, to continuous ownership by a single family over such a long period, Hedingham Castle, a classic motte and bailey structure modelled on Rochester, is still remarkably intact, and is said to be the best preserved of it’s type in Western Europe. “Sible” is a corrupted way of spelling Sybil or Sybille, thought to be Sybille de Coucy a Norman Lady of the Manor and wife of the notoriously brutal Engaine de Coucy, Count of Vermandois, known as “Raging Wolf”. His grandmother was the daughter of the first Earl of Oxford. The influence of the de Vere’s on the region has, to some extent, distracted attention from earlier periods. There is much material evidence of occupation in Anglo Saxon and Roman times, but until very recently less and less going further back in time. Landscape historian John Hunter attributes this to ‘a long history of cereal growing and a lack of local stone to build megalithic structures that would daunt later ploughmen and improvers’. Both Sible and Castle have fine churches. Pevsner thought St. Nicholas, Castle Hedingham, the most exciting church in Essex (thanks to de Vere money). It was originally dedicated to St. James of Compostela but rededicated after the Reformation. The two villages are linked by a road bridge over the Colne. The first bridge, built in 1720, replaced a ford which can still be detected a few metres downstream. The crossing is almost equidistant between the sites of the two churches, and in alignment with them and that of the Castle. East of the river and south of the road lies the field known as Sheepcote now part of Little Lodge Farm. Just beyond the southern boundary of the field stands a water treatment and pumping station built in 1992, and beyond it a small farm known as Maiden Ley. Before the treatment plant was built an archaeological evaluation of the site revealed evidence of ‘Roman industrial activity in the fourth century extending into the Saxon period’. Within the field towards it’s southern end stands a low mound (OS Ref. TL785348). It attracted my attention as soon as we moved to the village in 1993. Local folklore has it that it is ‘man made’ though it does not appear on any archaeological records. Having got to know the landowner I was able to get permission to dowse it after harvest in 1999 with my brother Martin. We found indications of seven rings of posts under it, together with a roughly circular group of six rectangular cist-like features which gave particularly strong responses. Strong responses were also obtained from male and female energy beams which home in on the mound from east and west and coil themselves round it in opposite directions. Along the lower, west, side of the field above the flood plain we detected a string of smallish circular features. The following year, at the northern end of the field, my rods led me to outlines suggesting a circular ditch and bank enclosure of the order of 250m diameter surrounding nine rings of post holes. To my surprise and delight I later discovered that a 1592 map depicts the mound as Draggon Hill. Further, the lane running north west out of the village, now Kirby Hall Road, was at that time known as Draggon Lane, and the property at it’s intersection with Nunnery Street is shown as Draggon Croft. East of the river, the two energy beams run roughly parallel some 200m apart in a north easterly direction. The male line runs straight to what is now the village playing field shown on the 1592 map as Chappel Yard. The Chapel is known to have been associated with a hospital built by the de Veres in the 13th century. Following a request I had dowsed the field in 2000 to try and locate the sites of both hospital and chapel which had eluded the 1995 geophysical survey. Near the north east corner of the field once stood a mediaeval Holy Well dedicated, like the church, to St. James of Compostela. The main street through the village is still called St. James’ St. When I dowsed the field the site of a much earlier, Neolithic, well or more likely a spring, emerged due west of where the hospital had stood. A small structure, a shrine probably contemporary with the hospital and chapel, appeared to have been built over it The site of it is visible in dry weather as a dark green patch of lush grass. Dowsing also detected a possible ditch and bank enclosure surrounding it, with three causewayed entrances. The male line from Draggon Hill runs into the top (east) side of the field, over the dowsed site of a burial ground adjacent to the chapel, over the hospital site and then round inside the course of the ditch and bank enclosure for approximately 180′. A sharpish right turn then takes it past the south side of the Church, through a residential area and eventually out of the village running along Draggon Lane. The female line from Draggon Hill’ runs up the scarp overlooking the valley (a possible Romano-British/Roman encampment has been dowsed along the ridge, and a mass of Roman tile was found there some years ago) until it reaches what is now the B 1058 Sudbury Road. It then swings left in a westerly direction via the Castle until it returns closer to the male line again in Draggon Lane, the two beams exiting the village along the line of the lane, then drifting north after half a mile. The two lines head north in close proximity passing just to the east of Little Yeldham Church (O/S Ref. TL 779396) but ignoring it. They then cross the Stour River close together, through the grounds of Clare Priory and then sweep round inside the earth bank of Clare Castle. They diverge to pass through the centre of the town and either side of Clare’s beautiful 14th century Church (St. Peter and St. Paul), the male line passing between the Church and Clare’s small independent Nethergate Brewery, brewers of excellent and much-prized traditional ales and porter. Following a generally similar course the two lines have been followed north from Clare, partly on the ground and partly by map dowsing. The male line makes straight for the ecclesiastical complex in the Abbey Grounds of Bury St. Emunds passing first through the larger and better known brewery of Greene King just south of the vast Parish Church of St. Mary. This Church, almost as big as a cathedral, stands on the south west corner of the Abbey grounds and the male line passes through the extreme east end of the building. It then takes in the present Cathedral (still unfinished), and through the site where, in pre-Reformation times, the Abbey complex had stood. At this point it intersects with the Michael and Mary lines, but continues due N/S without apparent deflection. The female line veers slightly to the west before entering Bury, passing roughly 1/2 km west of the Abbey, crossing Risbygate Street a few metres east of the Plague Stone. It must intersect with Michael and Mary somewhere in the residential area about 200m south of Risbygate St. since I picked up both of them crossing the Parkway car park and making a bee-line for the Abbey site. The female Draggon line then swings round to the right towards the north east to close in on the male line again somewhere near the roundabout on the A14 and A134. They were picked up again south of RAF Honington after which they head straight for the site of Thetford Priory. They then continue north via Fakenham and Walsingham till they were dowsed on a 1:50,000 map(too small) crossing the North Norfolk coast over the Stiffkey Marshes. From the west side of Draggon Hill between the Hedinghams the two beams cross the Colne River then track through a small industrial estate and over Swan Street ( the A 1017) once an ancient track , on either side of which modern Sible Hedingham has ‘just growed’. They spread out slightly to pass either side of St. Peter’s Church then curl left in a more southerly direction which takes them across the old WW2 Gosfield Airfield. They pass one each side of St. Katherine’s Church, Gosfield (TL 778293), after which they cross the B1053 just to the north of Braintree and through Convent Hill, Bocking. The two lines pass through the centre of Braintree heading almost due south at first and along the same alignment just to the west of the two Notleys, Black and White. Veering on to a slightly more south easterly tack they enter Froy’s Wood then cross the Terling Road just west of Witham at TL 795150. They cross the B1019 between Hatfield Peverel and Maldon at TL814104, then veer towards Maldon almost as if drawn by a magnet. The two lines sweep straight through a field which forms part of the grounds of Beeleigh Abbey(TL 840077), and was the site of a Heritage funded dig in the summer of 2003. Beeleigh Abbey stands about a mile to the west of Maldon on the south bank of the River Chelmer. The energies are particularly strong here and it is interesting that a resisitivity meter which attempted to survey the field is unable to operate satisfactorily in the area of the field through which the two beams pass. Even stranger, they divide here, one pair passing through the town before curling in a more southerly direction and crossing Blind Lane near Mundon Wash Bridge at TL875003, the Latchingdon Road at TL 867003 and the 000 parallel at TL 867000. The other pair of beams leave Beeleigh Abbey on a more south westerly line. They have been followed, again partly by map dowsing, to cross the 000 parallel at TL 804000 and 807000. The more easterly pair crosses the River Crouch just to the east of the villages of North and South Fambridge at TQ 855966 and 858966. They then drift slightly east crossing the low lying ground south of the river. It was here, between Battlesbridge and Canewdon, that Edmund Ironside was defeated by Canute at the Battle of Assandun(present day Ashingdon) in October 1016, the final nail in the coffin of Anglo Saxon England. The two beams cross the 940 parallel at TQ 861940 and 866940. The male line was traced passing through Ashingdon’s ancient church set high on a hill overlooking the river valley. It is said locally that Edmund prayed there the night before the fateful battle. The two lines continue southwards through Hawkwell. They were traced crossing the 910 parallel at 867910 and 872910, then through Southend Airport and into Prittlewell, where an Anglo-Saxon burial site of the highest importance, and in a remarkable state of preservation, came to light in February 2004. They pass through Westcliff-on-sea across the coast about a mile west of Southend Pier at TQ 868852 and 872852. The two beams which follow a more south westerly line from Beeleigh Abbey pass either side of the remains of a bronze age mound at TL 838072 just east of Abbey Turning Lane. They cross the B 1418 in the vicinity of Woodham Mortimer Hall, then the 000 parallel at TL 804000 and 807000. They skim the western suburbs of South Woodham Ferrers and cross the 96th parallel at TQ 796960 and 799960. Drifting slightly eastwards at first through the western extremities of Rayleigh they head due south through Thundersley (Thunor’s leigh) and South Benfleet before passing just to the west of Hadleigh Castle (TQ 798861). They continue on virtually the same North/South line into Canvey Island. At this level the two sets of beams which parted company at Beeleigh Abbey are a little over 7 miles apart. The two energy beams have no less than 15 strands each (or should we call them strings?). I was intrigued to find that they gave me a slightly different ‘feel’ to the Michael and Mary lines in which I counted 12 lines as they crossed the car park about 100m apart in Bury. 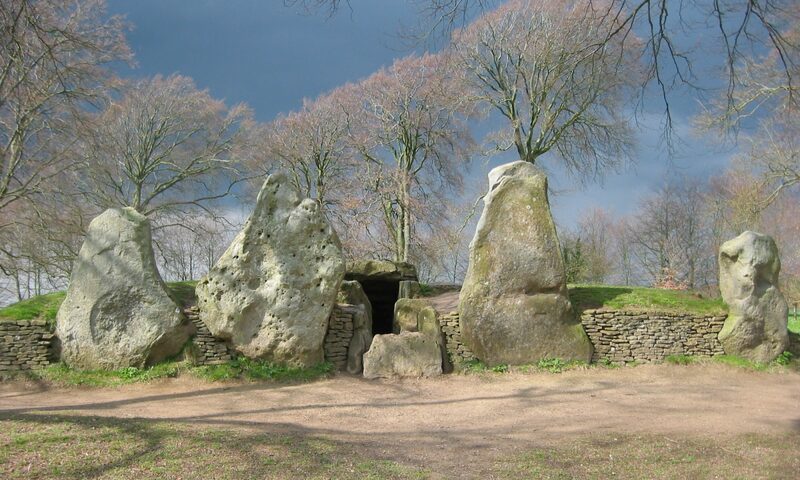 Draggon Hill gives unmistakeable indications that it was constructed with ritual purposes in mind. The effect of hill wash over time is readily seen both from the top and walking the footpath which runs below the field and along the river. As the mound is approached along the river footpath the earth banks up 4 to 5 metres high. Dowsing indicates an original height some 10 metres (40ft) higher than it is now. Dowsing the field also clearly picked up a double rectangular outer enclosure, cardinally oriented, and an inner circular enclosure, all these showing up as ditch and bank with a palisade on top of the banks. Although not as big as Silbury, Draggon Hill must have been quite an impressive local feature in it’s time. It seems unlikely to have existed in isolation but why was it located at the precise spot that it is? One possible clue which I didn’t twig till some time later is that it lies due south of the site of St. Nicholas Church, Castle Hedingham. Another clue may also lie in it’s alignment with the site of St. Peter’s, Sible Hedingham. Little Lodge Farm stands on the eastern scarp of the Colne valley at TL792354 roughly a mile from Draggon Hill which is no longer visible at that point. At the highest point on the brow east of the farm buildings is a small pond. Dowsing for prehistoric ritual sites the previous year I had been led to the pond as the possible site of a henge. Further to the east again beginning at about TL800358 is a patch of woodland rich in wildflowers known as Kendallscroft Grove, not very ancient though old strip cultivation lines can still be seen in it. In the field to the east of Kendallscroft Grove I have more recently dowsed a cursus. (I have dowsed sections of what I am confident are two other cursuses close by but much more time is needed to devote to the area). It is on a fairly level plateau between the Colne and Stour Rivers which could have been a main early ritual centre in the stretch of country between the two rivers which are about 5 miles apart at this point. Dowsing close to the north-east end of the wood (Kendallscroft Grove) I picked up the outlines of two circular ring ditch features, one about 70m diam and the other much smaller about 20m diam. Both lie within a few metres of the western end of the dowsed cursus. Dowsing the features of the cursus took me several days. It appears to have been about one kilometre long in four sections, ditch and bank with palisade on top of the bank. The westernmost section starts just a few metres east of the wood (Kendallscroft Grove). It aligns with the henge site above Little Lodge, Draggon Hill, and the site of St. Peter’s Church Sible Hedingham across the Colne valley. Further, I have recently detected within Kendallscroft Grove, indications on the same line, suggestive of a long mortuary enclosure. This alignment with the Little Lodge henge, Draggon Hill and St. Peter’s appears to be that of Beltane Sunrise. It is intriguing to look at the general line of the B.1058 road. Although the present road wanders about as a result of boundary changes over the ages, it’s general alignment from the crossing of the Stour River at Ballingdon Bridge approaching Sudbury (TL 868409), through the Hedinghams as far as Wethersfield (TL 711312) runs parallel to the Draggon Hill- St. Peter’s alignment. The site of Wethersfield Church also gives hints of a pre Christian past and I have dowsed the outline of what appears to have been a small henge approximately 50m due south of the Church. There is much other evidence of early human activity around Wethersfield. When Draggon Hill was first constructed and at it’s full height, it would very probably have been visible from the henge site atop Little Lodge Farm and certainly from the site of St. Peter’s Church which has quite a distinctive setting in the local landscape. It is the only church I have dowsed so far which gives hints of four streams running under it. Three appear to cross under the chancel, but the fourth passes almost N/S under the tower at the west end. I detected a band of detrimental energy associated with it, and it is on this that I get the response that human sacrifice may once have been practised here. St. Peter’s is said by some to be a ‘cold’ church. One parson who has taken services there confided in me that it is a church in which he has never felt comfortable. It doesn’t have that effect on me. Dowsing suggests a very early date for the site, possibly around 3500 BC. The site of St. Nicholas, Castle Hedingham, gives me around 3000 BC and possible animal, though not human, sacrifices. As with the Michael and Mary and the Apollo Athena lines the energy beams from Draggon Hill, as far as I have been able to dowse them so far; pass through a sequence of places most of which have significant religious/spiritual histories. Some have also been centres of secular power and influence. Both the Hedingham Churches give hints of early ritual activity and the Castle of the de Vere’s dominates the Colne valley in it’s vicinity. Clare was also once a centre of power and influence. Following the Norman Conquest Richard Fitzgilbert, Count of Brionne, was granted a total of 170 manors. Out of them all he chose ‘The ‘Honour of Clare’ as the seat of his barony, becoming Baron de Clare. His family gave the name to Co. Clare in Ireland and Clare College, Cambridge. For a time the de Clares seem to have been one of the most powerful families in the land. When the 26 Barons gathered a few miles up the road at the Shrine of St. Edmund in November 1214 to set out what became Magna Carta, the names of Richard de Clare, Earl of Clare and Hertford, and Robert de Clare, Earl of Gloucester, head the list. Robert de Vere, 3rd Earl of Oxford, (he had a de Clare grandmother) was another but lower in the pecking order. Clare claims to have the first Augustinian Priory to be established in England. Founded in 1248 it was suppressed at the Dissolution but re-established by the Roman Catholic Church in 1953. Bury St. Edmunds has long been acknowledged as an important spiritual centre and for centuries a magnet for pilgrims. It is, of course, on the Michael and Mary lines. The original church (1065-1098) was dedicated to St. Denis but replaced by another dedicated to St. James of Compostela as is the Cathedral of today. The Abbey of St. Edmundsbury became the richest in England and one of the greatest ecclesiastical foundations of mediaeval Europe. In ‘Lines on the Landscape‘ Nigel Pennick and Paul Devereux point out, further, that the northern section of the dog-leg cursus at Fornham All Saints aligns on the Abbey site which suggests a significance long before the Christian era. The diocese of East Anglia was originally sited at the small Saxon Church of North Elmham. After a time it was not thought big enough so in 1075 the see was transferred to Thetford where the great Church of St. Mary became the cathedral of the diocese. However, disagreements between the King, bishops, and warring barons led to the diocese being transferred to Norwich in 1094. Thetford Castle, built by Roger Bigod, Earl of Norfolk, is said to have had the highest Motte in England. Pennick and Devereux in ‘Lines on the Landscape‘ refer to a 1932 paper in the proceedings of the Suffolk Institute of Archaeology and Natural History which describes the Beltane Fire Line sunset alignment running for 40 miles between Thetford Castle Mound and Walton near Felixstowe as ‘Perhaps the finest example in Great Britain’. The abandoned Church of St. Mary was restored by Roger Bigod and became the nucleus of the Cluniac Priory. In 1061 a vision of the Virgin Mary appeared to a widow and told her that she should build a replica of the Holy House of the Annunciation at Nazareth near two wells at Little Walsingham. Mediaeval pilgrims visited Walsingham in the belief that they really were visiting the Holy House which had been miraculously recreated. Although everything was destroyed during the Reformation, revival in the last century has led to Walsingham becoming the most visited of all the Holy Well sites in England. Maldon stands at the inner end of the long Blackwater estuary whose many miles of muddy creeks and inlets constitute a wildlife habitat of major importance. ‘Maeldune’ claims to be ‘Britain’s oldest recorded Port’ and is probably best known these days for the salt which bears it’s name and which has been produced along the estuary since time immemorial. Oak posts , the remains of old fish traps, can still be seen sticking up out of the mud at low tide along parts of the estuary. Some have been radiocarbon dated to the 8th and 9th centuries. Just to the south of the town near the causeway to Northey Island is the site where the Battle of Maldon was fought in 991. The colourful Hythe is haven to a few of the surviving, and lovingly restored,’ Thames’ barges and other historic craft. The old town stands on a ridge which rises quite steeply from the marshy ground where the Chelmer and Blackwater Rivers converge and flow into Colliers Reach and the estuary. Approaching it from the north and east along the now commercialised Fullbridge causeway, it is not difficult to sense the symbolic significance which the site might once have had, to say nothing of it’s strategic potential. Maldon is another centre with a strong religious tradition. Beeleigh Abbey, a Premonstratensian foundation (the White Canons), a mile to the west of the town was founded in 1180. A Carmelite Friary was established in Maldon in 1293 and it has churches of early foundation dedicated to All Saints, St. Peter, and St. Mary the Virgin. It’s ecclesiastical monuments are the focus of study by the Maldon Archaeological and Historical Group. One of their members, dowser Stephen Nunn, worked with Denis Briggs and Richard Bailey, authors of ‘Dowsing and Church Archaeology‘ in the 1980’s. Stephen is the author of several highly acclaimed accounts of different aspects of Maldon’s ecclesiastical history. Beeleigh Abbey is of particular interest and I had the good luck to be asked to dowse there, albeit rather briefly, at the end of the dig in July 2003. In the area of the field which was upsetting the resistivity meter dowsing detected the outline of a circular ditch and bank feature of approximately 50m. diameter with six concentric rings of posts. These appear to have been very closely spaced and , if it is possible to confirm the dowsed finding, they would probably have formed part of the structure of a building, or alternatively, of a mound. Dowsers have come up with both answers! Since the 1930’s Beeleigh Abbey has been owned by the Foyle family (Foyle’s Bookshop in Charing Cross Road). Christopher Foyle, who now lives there, has initiated a major restoration of the whole property. Being privately owned, naturally, access to it is restricted. The roughly North/South alignment followed by the two energy beams which I first picked up at Draggon Hill seems to fit reasonably well into the grid system shown by Marcus Rouse opposite page 16 of his booklet ‘Aldbourne Down’s Hexagon – evidence of prehistoric mapping?‘” In addition, the alignment between Draggon Hill, St. Peter’s Sible Hedingham, and several possible ritual sites running parallel with the B 1058 road looks similar to the Michael & Mary Beltane Sunrise alignment, also shown on Marcus’ Triangulation map. But they must remain questions – in addition to many others. 1.What was the route the energy beams took before Draggon Hill came into being? 2. Assuming Draggon Hill was deliberately constructed and precisely located, was it intended to have an influence on the two beams? 4. From the winding ‘S’ line that the beams snake their way through the two Hedinghams, with Draggon Hill in the centre, it is tempting to assume that the structures of the two Churches and the Castle must also be having some influence on the two energy beams.. The same applies as one traces their route through Clare. Why is it, therefore, that they appear to pass through Bury St. Edmund’s with barely a nod, and apparently ignoring Michael and Mary completely? 5. Another interesting question could be phrased ‘Can a Draggon have two tails’. What causes the beams to divide at the Beeleigh Abbey Site – assuming that they really do? Are there other similar examples elsewhere? 6. To what extent does the history of the various places through which the beams pass have any influence on them, or vice-versa? 7. Some prehistoric mounds have been found to have a sandwich type of construction with alternate layers of soil and organic material which is said to give them qualities of electrical capacitance. This presumably has some effect on the local energies. It is tempting to assume that the people who built these mounds might have known this, but is there any way that we could ever prove it? “The Essex Landscape, A study of its form and history“. John Hunter. Essex Record Office. ISBN 1 898529 15 9. “The Sun and the Serpent”. Hamish Miller & Paul Broadhurst. Pendragon Press. ISBN 0 9515183 1 3. “The Dance of the Dragon”. Hamish Miller, Paul Broadhurst, Vivienne Shanley, Ba Russell. Pendragon press. “Lines on the Landscape”. Nigel Pennick & Paul Devereux. Robert Hale. ISBN 0 7090 3704-X. “Stonehenge and Timber Circles“. Alex Gibson. Tempus. ISBN 0 7524 1492 5. “St. Roger of Beeleigh“. Stephen.P.Nunn. MAHG. ISBN 0 9511948 4 4. “Robber Barons & Fighting Bishops – The Mediaeval Chronicles of East Anglia“. Derek Ritchings & Roger Rudderham. John Nickalls. ISBN 1 904136-14-1. The Illustrated Oxford History of Christianity. “The de Veres of Castle Hedingham“. Verily Anderson. Terence Dalton. ISBN 0 86138 062 2. Journals of the Colne Stour Countryside Association.